This post was sponsored by the Florida Department of Citrus. While my time was compensated, all thoughts and opinions are my own. Thanks for supporting the brands that make this blog possible! This time of year, it’s hard to escape the “start the year off right” frenzy. I drove past our local gym earlier today and the parking lot looked like the Atlanta airport the day before Thanksgiving. My Facebook feed is drowning with photos of acquaintances sharing “virtuous” meals and calls to join their not-a-diet-but-a-lifestyle-change group (but come on guys, it’s really a diet). And I’ve heard the word “keto” more times in the past week than I did during my entire pediatric nutrition rotation, where I actually worked with kids who needed a keto diet out of medical necessity to treat life-threatening epilepsy. In the midst of the “new year, new you” rush, we forget the fact that wellness isn’t a yearlong struggle, but a day-to-day journey. It’s not about restriction and abstinence, but rather adding positive things in (and perhaps letting go of some things we no longer need). We don’t know what challenges and opportunities the year is going to bring, so instead of trying to get the year “right,” why not take a step back on focus on starting off each day on a good foot. For me, that means a nourishing and delicious breakfast that gets me energized. Perhaps one featuring Florida Orange Juice? Ever since I was a kid, I was a major snob for Florida Orange Juice. My grandparents lived in Florida for the summer, so whenever we visited, they would take my brother and I to a citrus orchard and we would pick up freshly pressed OJ. It was one of those things were even as a child, I could taste the difference. I especially love that this time of year, oranges are a good source of immune-boosting vitamin C. It’s also a good source of potassium, which is helpful for maintaining good blood pressure, and folate, which is important for women who are pregnant or thinking about trying, as it helps reduce the risk of neural tube defects. You can also look for orange juice that’s fortified with calcium and vitamin D for healthy bones. I love make ahead breakfasts like this one because I am not, and never will be, a morning person. 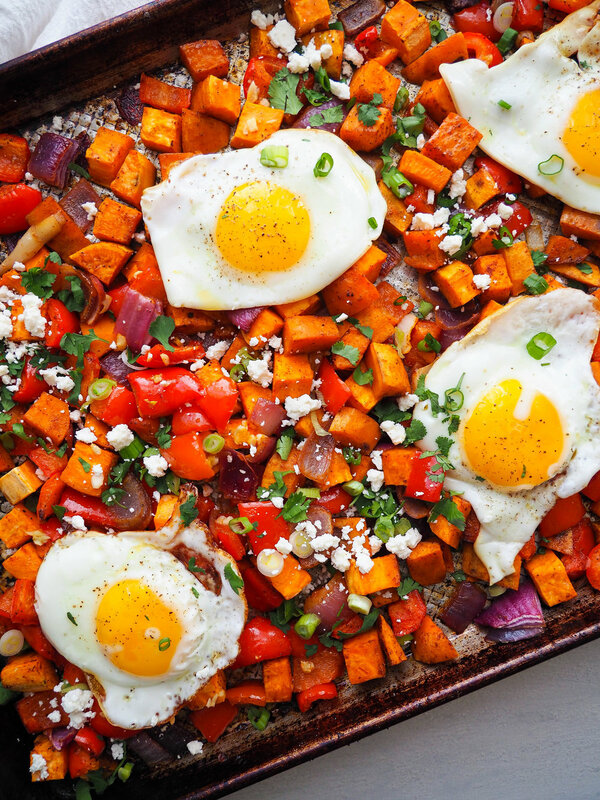 Roast the hash on the weekend, refrigerate and fry up an egg when you’re ready to eat. You could also enjoy this meal for dinner! Be sure to keep up with the Florida Department of Citrus for more OJ inspiration! On a large rimmed baking sheet, toss together sweet potatoes, onion and bell pepper with olive oil, cumin and chili powder. Season with salt and black pepper to taste. Place in a preheated oven and roast 20 minutes. After 20 minutes, remove from over and pour orange juice over the top, flipping the vegetables and scraping up any browned bits on the skillet. Mix in he garlic and place back in the oven for 10 minutes to continue roasting. While vegetables finish roasting, heat a little olive oil in a large nonstick skillet and fry the eggs as desired. Serve the hash topped with fried eggs and garnished with cilantro, green onions, cheese and hot sauce, as desired.